Back in April, Doug Coby walked away from a wrecked race car without even completing one lap in the Icebreaker 150 at Thompson Speedway Motorsports Park. 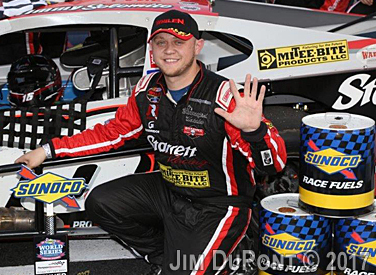 Six months later, Coby capped the season at Thompson by completing an unthinkable comeback to win his fifth NASCAR Whelen Modified Tour championship. Coby and Partridge will be honored as champions of the unified Whelen Modified Tour as part of the champions celebration in Charlotte, North Carolina in December. Sunday At Thompson International Speedway, Thompson, Conn.
1. (8) Timmy Solomito, Islip, N.Y., Ford, 155 laps, 65.309 mph. 2. (1) Chase Dowling, Roxbury, Conn., Chevrolet, 155. 3. (10) Ron Silk, Norwalk, CT, Chevrolet, 155. 4. (6) Rowan Pennink, Huntingdon Valley, Pa., Chevrolet, 155. 5. (2) Doug Coby, Milford, Conn., Chevrolet, 155. 6. (19) Andrew Krause, Holmdel, N.J., Chevrolet, 155. 7. (21) Woody Pitkat, Stafford, Conn., Chevrolet, 155. 8. (18) Dave Sapienza, Riverhead, N.Y., Chevrolet, 155. 9. (33) Jamie Tomaino, Howell, N.J., Chevrolet, 155. 10. (14) Justin Bonsignore, Holtsville, NY, Chevrolet, 155. 11. (17) Gary Putnam, Vernon, Conn., Chevrolet, 155. 12. (4) Rob Summers, Manchester, CT, Chevrolet, 155. 13. (7) Burt Myers, Walnut Cove, N.C., Chevrolet, 155. 14. (23) Matt Swanson, Acton, Mass., Ford, 155. 15. (27) Calvin Carroll, Newton, N.J., Chevrolet, 155. 16. (16) Eric Goodale, Riverhead, N.Y., Chevrolet, 155. 17. (13) Spencer Davis, Dawsonville, Ga., Chevrolet, 155. 18. (29) Wade Cole, Hartland, Conn., Ford, 155. 19. (9) Jimmy Blewett, Howell, N.J., Chevrolet, 154. 20. (5) Craig Lutz, Miller Place, N.Y., Chevrolet, 154. 21. (25) Danny Cugini, Marshfield, Mass., Chevrolet, 147, accident. 22. (35) Cory Osland, East Hampton, N.Y., Chevrolet, 143, accident. 23. (34) Manny Dias, Attleboro, Mass., Chevrolet, 138, handling. 24. (15) Kyle Soper, Manorville, N.Y., Chevrolet, 137, accident. 25. (12) Ronnie Williams, Ellington, Conn., Chevrolet, 131, accident. 26. (3) Ryan Preece, Berlin, Conn., Chevrolet, 117. 27. (32) Walter Sutcliffe Jr., East Haven, Conn., Chevrolet, 113, handling. 28. (24) Austin Pickens, Windermere, Fla., Chevrolet, 80, accident. 29. (11) Bobby Santos, Franklin, Mass., Chevrolet, 52, ignition. 30. (31) Melissa Fifield, Wakefield, N.H., Chevrolet, 19, clutch. 31. (30) Gary McDonald, Ronkonkoma, N.Y., Chevrolet, 9, accident. 32. (20) Anthony Nocella, Woburn, Mass., Chevrolet, 0, accident. 33. (22) Andy Seuss, Hampstead, N.H., Chevrolet, 0, accident. 34. (26) Ken Heagy, Calverton, N.Y., Chevrolet, 0, accident. 35. (28) John Baker, Selden, N.Y., Chevrolet, 0, accident. Caution Flags: 12 for 57 laps. Lead Changes: 5 among 5 drivers. Lap Leaders: D. Coby 1-82; C. Lutz 83-107; R. Silk 108-144; J. Bonsignore 145; R. Silk 146-153; T. Solomito 154-155. 6. R. Preece, 562; 7. D. Sapienza, 511; 8. M. Swanson, 484; 9. R. Summers, 474; 10. C. Lutz, 429.